Most governments in Europe and America are running big public deficits and see their debt approaching 80-100% of GDP. This is causing the Euro and the debt crisis, which is now prompting the ECB and the Fed to purchase (even more) government debt. Spending more money than what you earn is unsustainable. This is also true on a personal level. And since my blog is addressing were passionate tea people, I would like to give you a word of caution on tea spending and some solutions to enjoy great teas at a minimum cost. Thanks to credit cards, it's easy to get carried away and spend more than you should or can afford. And since you need a credit card to debit your Paypal account to pay for your Internet orders, the temptation is there. Nevertheless, I sincerely hope that you have already saved enough to make your tea order, or that it's within your normal budget. 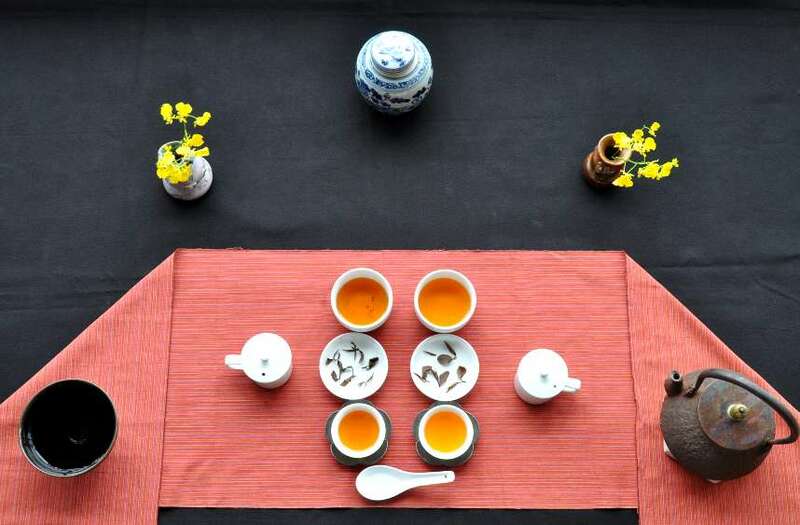 The pleasure of enjoying tea shouldn't be clouded by the worry of reimbursement. Life and work is about giving and taking. We earn money by giving our time and effort to help others ; and with this money we can purchase what we need and desire. 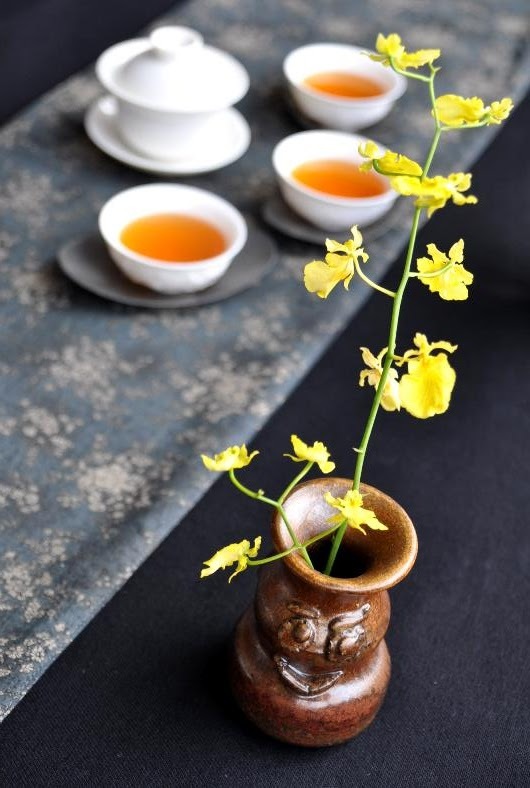 To have a mind at ease that is receptive to the delicate pleasures of tea, we need to lead a well balanced life, including our finances. 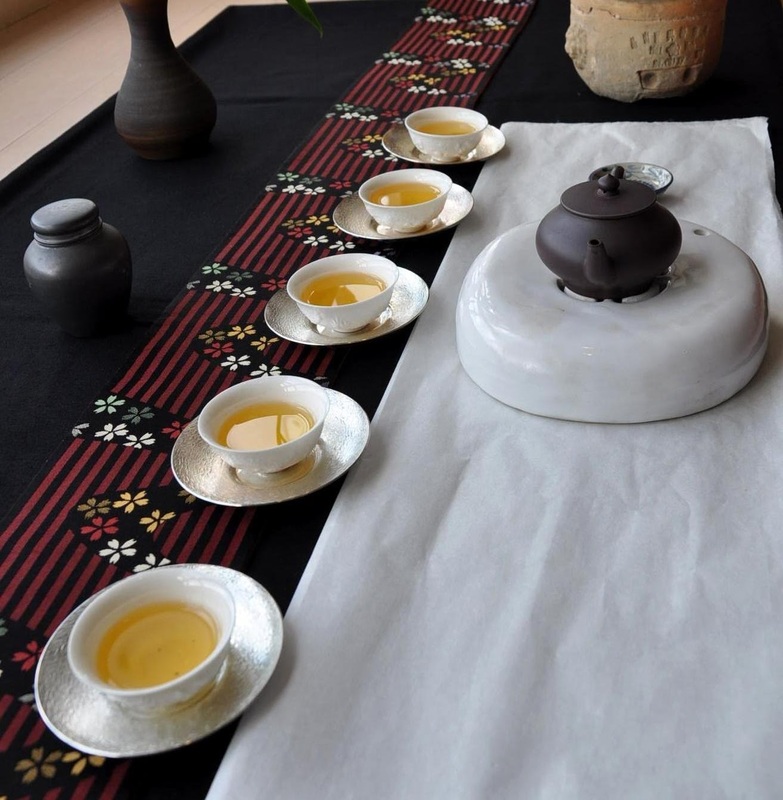 In the Cha Jing, Lu Yu writes that bad tea can be harmful to the body. 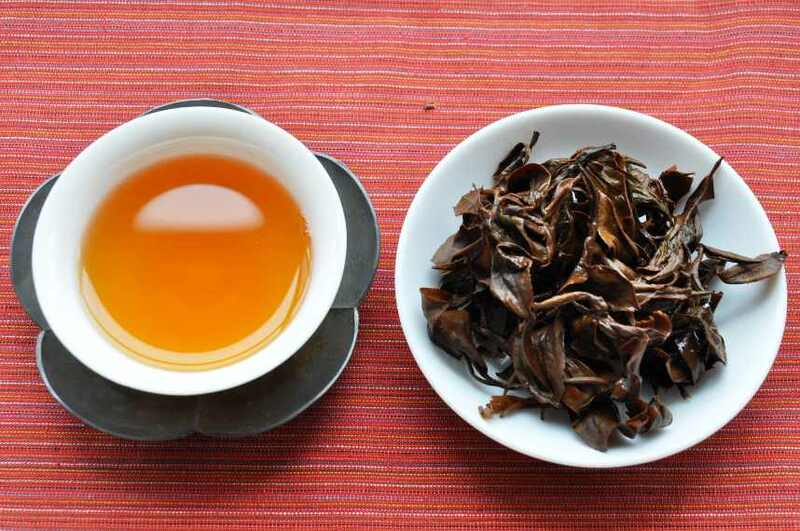 Therefore, I'm not going to recommend selecting low quality leaves to reduce your tea expenses. 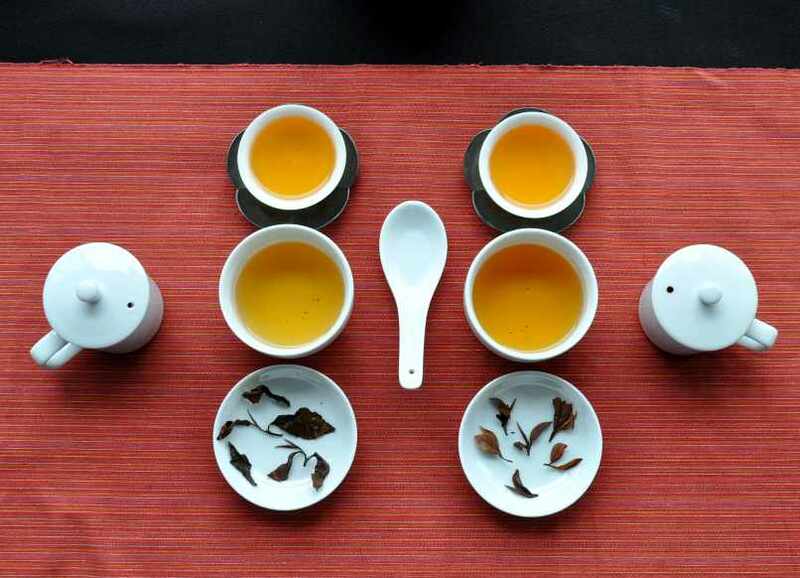 A better strategy is to lower your consumption with smaller tea ware. I've noticed that my qingbai mini gaiwan is very popular with students! Its volume is 85 ml to the top and 60 ml in normal use. 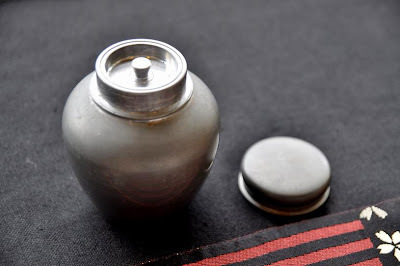 Its tea can fit in just 1 singing cup! 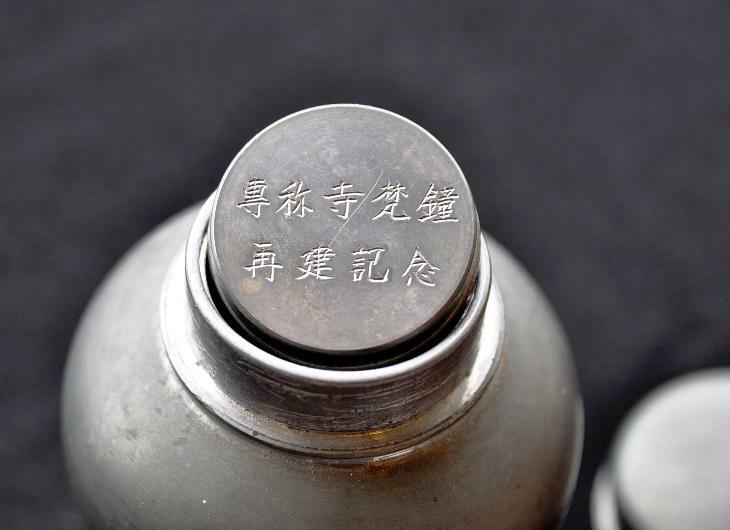 The classic qingbai cup has a volume of 53 ml. And I'm introducing a new qingbai mini cup with a volume of 33 ml to the top and 20 ml in normal use. (Like this 3 people could share 1 mini gaiwan!) Weight: 20 grams. 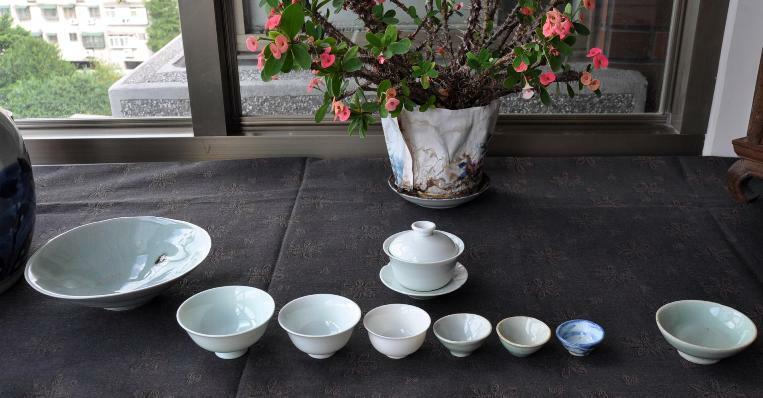 For comparison, I've added 2 old mini qingbai and 1 mini qinghua cup.You can see that ancient Chinese used this strategy of downsizing! They also understood the law of diminishing returns for food pleasures: the quality of the first cups matters more the quantity you drink. The second strategy is that less can be more. 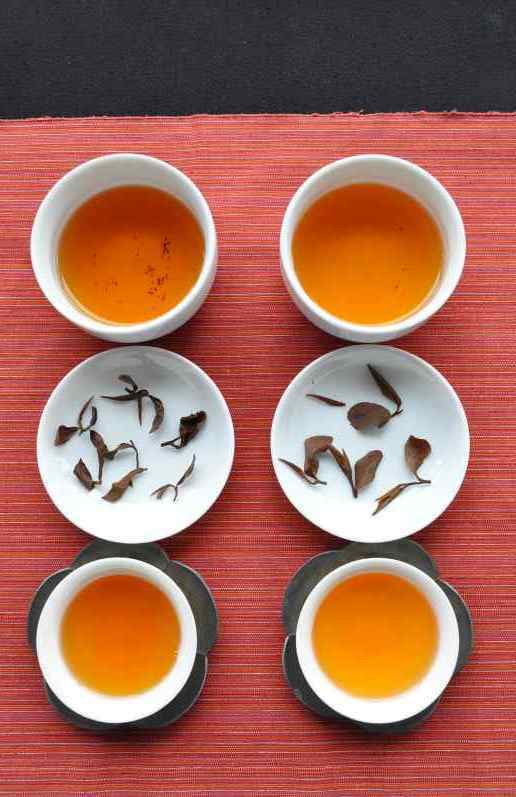 If you brew top quality tea, you often need less leaves, because good leaves contain more energy and good tastes. And they age better. Don't throw away unfinished bags of good tea! 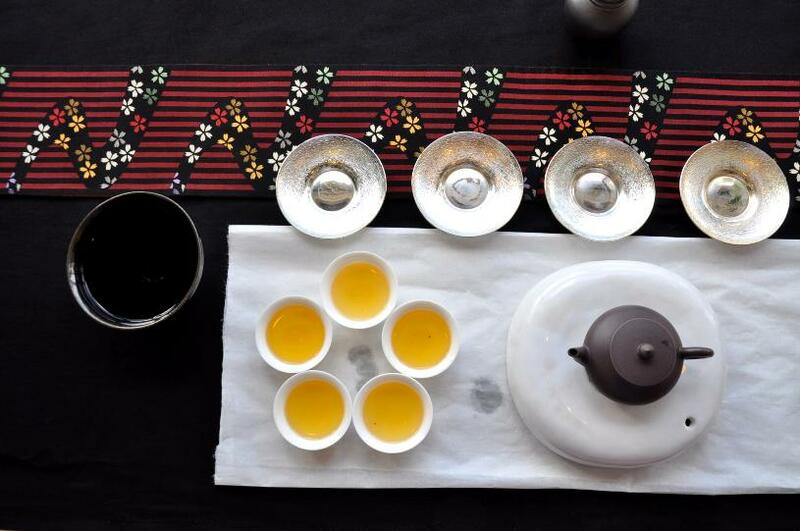 And if you still have unroasted Oolongs or Baozhongs (or green tea), try to finish them before ordering more. 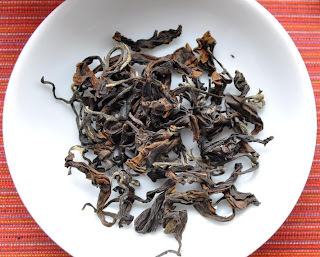 I also brewed the rest of my 2011 spring Shan Lin Shi Oolong recently and found that the aging had had a stronger effect on the freshness of that tea. It felt more oxidized, less 'green'. The taste had a slight fruity sourness and more warmth. As temperatures have dropped here, I found this change of character quite soothing and relaxing. 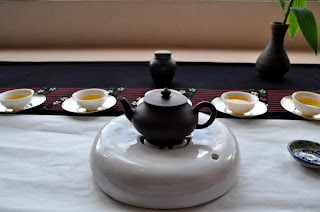 What's important is that the tea was still powerful and sweet. A last tip is to brew until the leaves have been fully exhausted! I'm still surprised, from time to time, by how good that very last brew can taste. 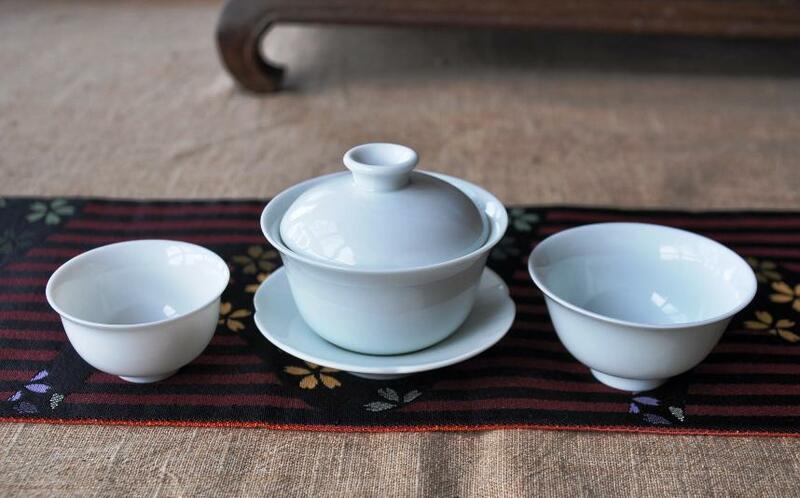 Neutral, small and thin qingbai porcelain makes tea a luxury we can all enjoy and afford! Note: The big qingbai ware you see in the last picture is a rather flat bowl by David Louveau (and I'm using it here for waste water). La pleine lune de la mi-automne est une grande fête traditionnelle chinoise. Elle se déroule au milieu du huitième mois lunaire, ce qui coincide environ avec le début de l'automne occidental (21 septembre). Cette année la fête tombe le 30 septembre. La lune sera alors la plus ronde et la plus belle de l'année. C'est aussi un moment d'opulence où les chaleurs estivales s'adoucissent enfin et où l'on engrenge les récoltes. De nos jours, les Taiwanais célèbrent cette fête par une grillade en plein air, arrosée, soit de bière, soit de thé. 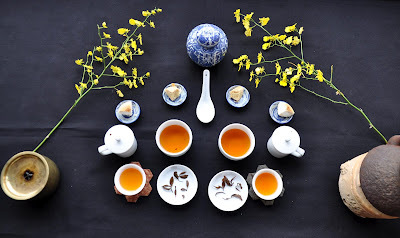 La composition de mon Cha Xi reprend le thème de la fête de la pleine lune. Sur fond noir (la nuit), se déroule un tissu aux couleurs de l'automne. La lune est représentée par le bâteau à thé blanc sur un papier à calligraphie (car elle brille fort cette lune). Le thé, servi dans mes coupes en porcelaine 'dragon' de Dehua, fait le lien entre la lune et l'automne. Les Cha Tuo ronds, brillants, évoquent eux aussi la plénitude de la petite soeur de notre planète. Ce lien tissé par le thé entre la lune et l'automne évoque aussi le lien que le thé lie entre le monde et moi. 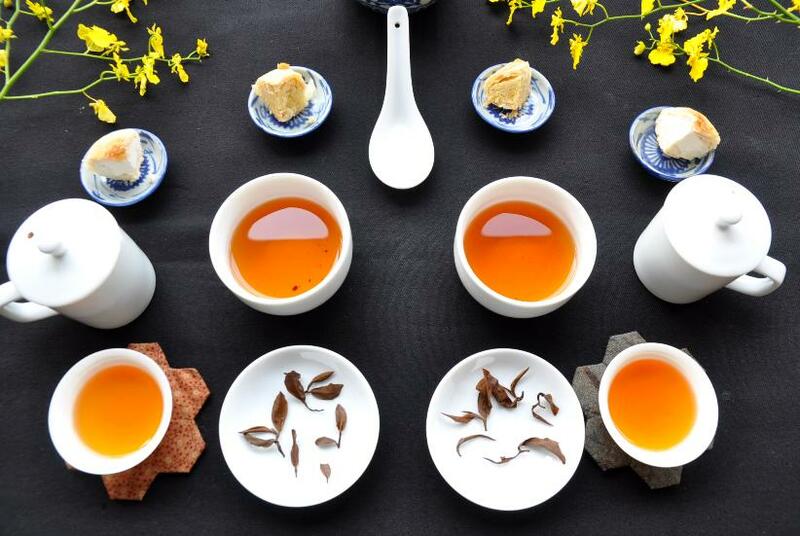 Le thé me permet de voyager dans la nature, par les arômes de son terroir. Il m'emmène aussi dans la culture chinoise et me permet d'exprimer des émotions de manière créative. Ce qui rend ces feuilles de Hung Shui particulières est leur conservation, depuis plus d'un an, dans cette petite jarre en étain. D'habitude, je prends ce thé de son sachet en plasitique d'origine. 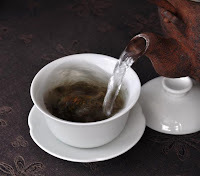 Je reconnais leurs arômes, mais l'infusion est un peu différente, comme la pleine lune d'automne. Elle est plus pleine, plus ronde. Les senteurs sont plus concentrées et distinctes. Le goût est plus moelleux et délicat. 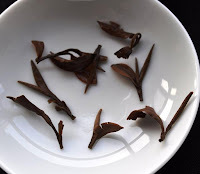 La force de ces feuilles se traduit aussi par une longueur en bouche plus douce et harmonieuse. 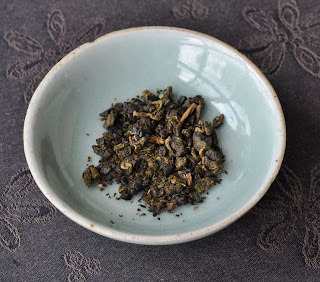 Ce Hung Shui Oolong d'Alishan est ainsi au firmament et nous donne le meilleur de lui-même. La théière d'Yixing y est aussi pour quelque chose dont cette apogée. Elle ne fait donc pas tache (lunaire!) sur ce bateau! 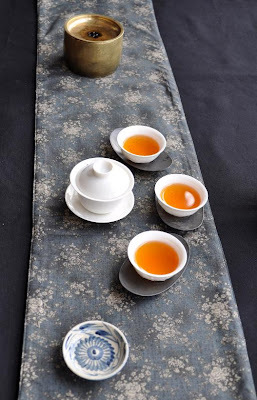 J'avais envisagé un gaiwan blanc ou une théière en porcelaine pour mieux représenter la lune, mais l'infusion n'aurait pas eu ce rendu si suave et intense. 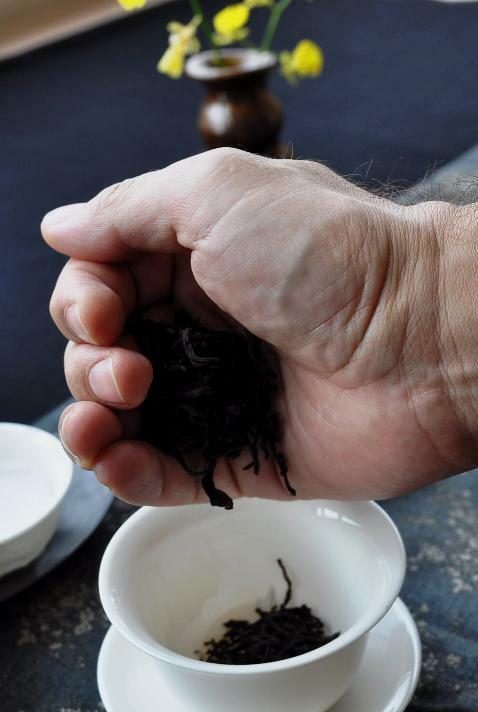 La transparence du thé est excellente. 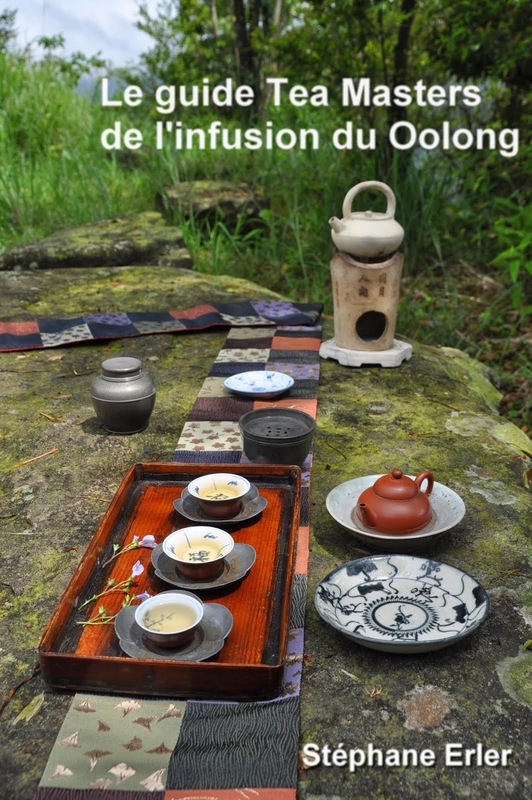 Dans ce moment de thé paisible, accompagné d'une musique relaxante et hors du temps (guqing), tous mes sens sont en émoi. Je me sens presque transporté jusqu'à la lune! This cultivar was obtained in 2004 by crossing qingxin oolong with jinxuan oolong. 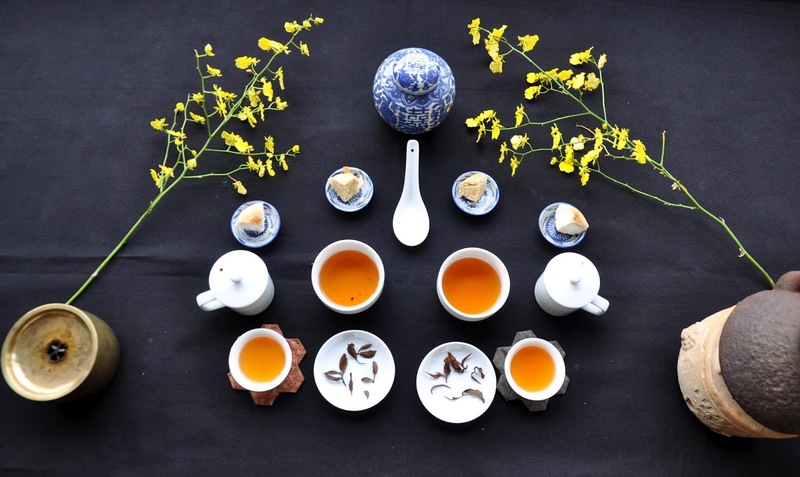 It is recommended to make Baozhong tea. This makes sense, since all these samples were obtained from the Wenshan area (famous for its Baozhongs). Appearance: The leaves are greenish and with fur. The smell is intoxicating, but it also has a tofu lu smell, which feels heavy and disturbing. Appearance: long and red dry leaves. Little fur. The dry scents have the intoxicating scent I like and no defects. The brew of the Bi Yu is darker. Both have a good clarity (or turbidity if you want to use a more technical word). 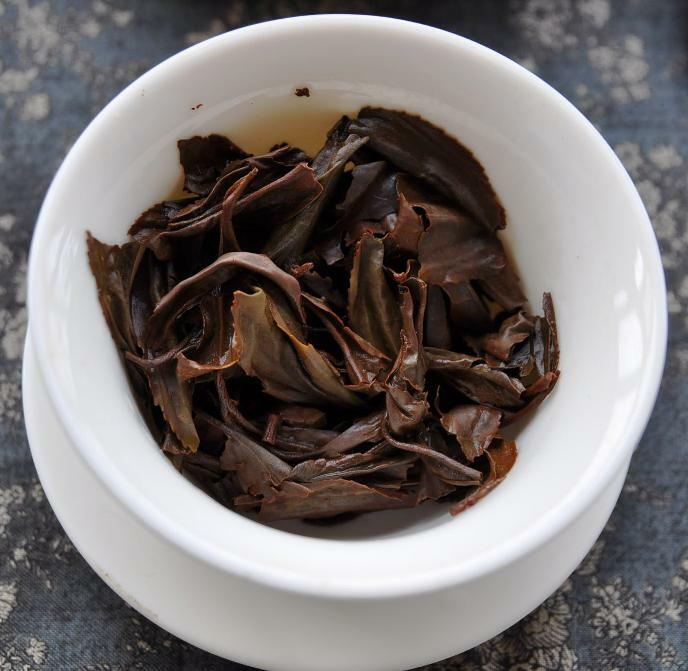 The Bi Yu leaves appear darker than the Tsui Yu. 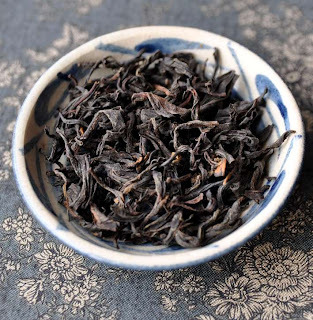 The tea has a strong ripe smell that reminds me of soy sauce. The taste is weak and I feel my throat closing, which is a bad sign. This last problem could be a defect of production instead of weakness of the cultivar. Nevertheless, overall the Bi Yu doesn't seem to make a good Oriental Beauty. 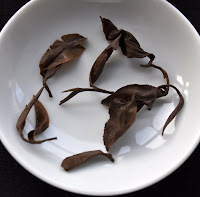 The leaves of the Tsui Yu are very young. The fruity fragrance is clean and high pitched. The taste is mellow, but doesn't last very long. The tongue feels a little bit 'heavy', unclean afterwards (too much fertilizer, maybe). 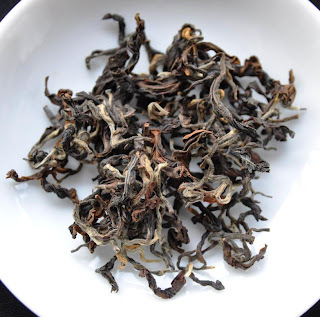 Still, it beats the Bi Yu and shows why Tsui Yu is quite a popular cultivar nowadays. For the decoration, I'm having some fun using the small vases made by my children (in Yingge, with the help of a potter). 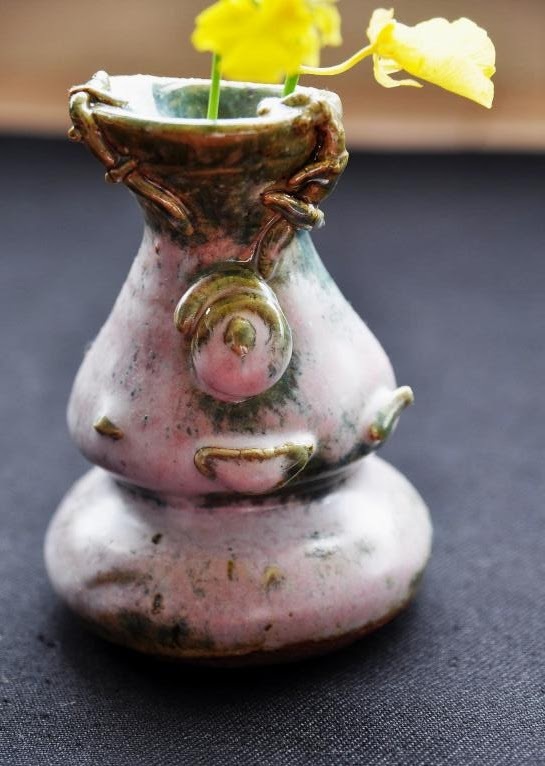 This is what happens when Sponge Bob character Plankton inspires pottery! Kids love to play with clay and they are happy to see their works on my Cha Xi. 3. Left - Tao Ren. The leaves are dark, long and thin. We see few white buds. 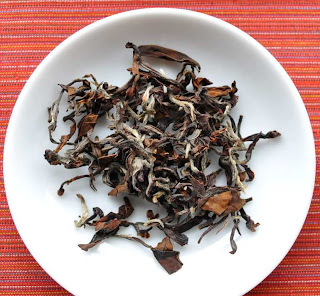 The dry smell is fruity with a hint of chocolate and quite pleasant. The brew has a light orange color and a good clarity. The scents are complex and ripe. But they lack elegance and finesse. 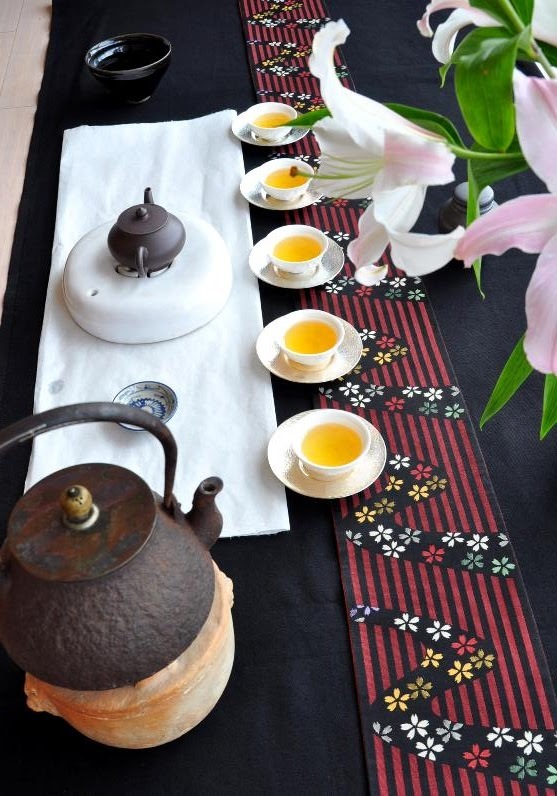 The dry colors are closer to a '5 colors tea', the synonym of Oriental Beauty. The many tips are very furry and large. The dry smell feels too 'green'. The oxidation seems to have stopped too early. The brew is darker and has a good clarity as well. 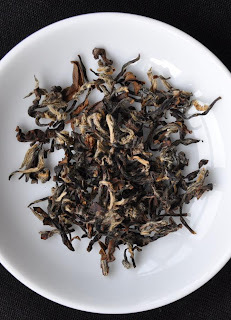 The Tao Ren Oriental Beauty is a mixed bag. It includes tips and older leaves. The taste is sweet and nice, but there are some wrong fragrances. The Man zhong leaves are smaller and orange. The fragrances are light and simple. The taste is sweet and there is a decent aftertaste. Unfortunately, it also leaves some unpleasant dryness in my throat. I haven't spoken a word about the tea jassids. Oriental Beauty is mostly known for the fact that the leaves are bitten by these insects. But these tea jassids don't always come. On the leaves I have tasted, there was very little evidence of their bites. (I also remember that 2010 was a difficult year to find a good Oriental Beauty...) Still, even without them, it's possible to produce Oriental Beauty! 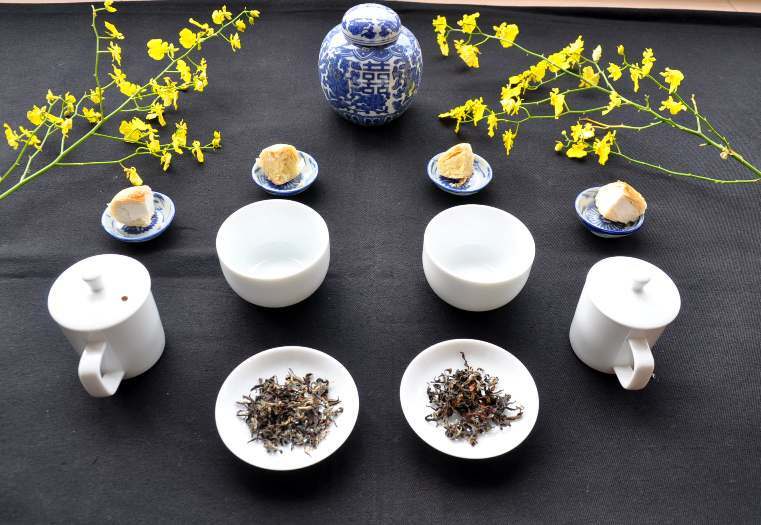 This tasting didn't reveal a flawless Oriental Beauty. 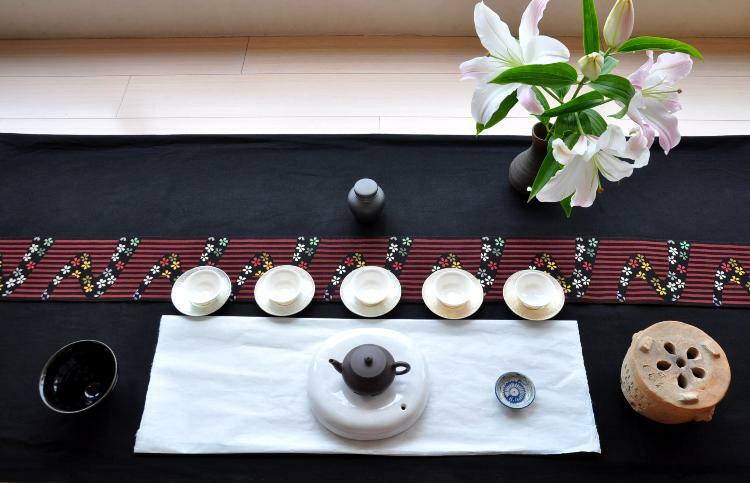 It shows, again, how varied Oriental Beauty can be from one cultivar to another. Tasting average Oriental Beauties could be a disappointment. 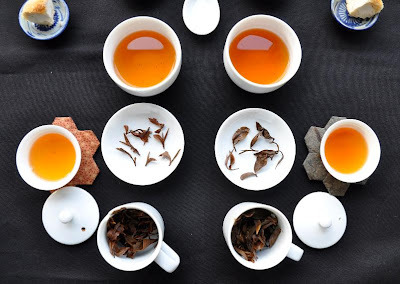 What makes this interesting is the fact that we know the cultivar of each sample. Récolté à la main au printemps 2012. Process: feuilles oxydées presque entièrment (thé rouge). 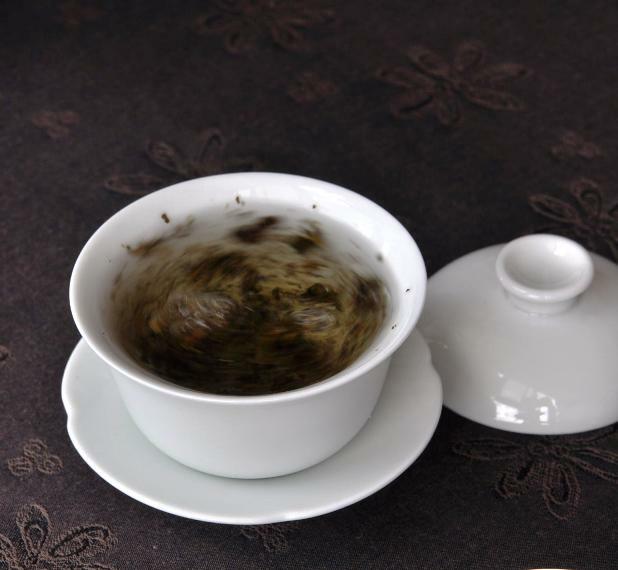 Infusion en gaiwan en porcelaine ivoire. Eau bouillante chauffée (au gaz) dans une tetsubin. Je dépose délicatement les feuilles au milieu du gaibei en les faisant glisser de ma main. 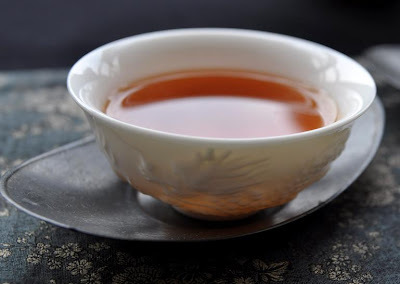 C'est un geste assez lent, puisque l'on cherche le calme pour mieux apprécier le thé. Ce contact tactile entre la main et les feuilles vient enrichir l'expérience sensorielle de voir, sentir, puis entendre tomber les feuilles (et finalement goûter leurs arômes). Chaque thé a un toucher différent, comme la poignée de main varie d'une personne à une autre. Chez ce thé, je ressens immédiatement une force dure et souple, malgré la finesse des feuilles. L'intimité entre moi et le thé commence par cette prise en main. Ce geste est une appropriation ; à l'opposé, il y a la frustration d'un signe "Ne pas toucher". Le thé m'appartient en faisant un avec mon corps. Je ne cherche pas à m'en distancer en évitant son contact. (D'ailleurs, je ne considère pas que les feuilles sont sales et ont besoin d'un rinçage!) La chaleur de ma main est un premier préchauffage. "Si vous êtiez ces feuilles de thé, préferiez-vous glisser sur un tobbogan lisse et froid pour tomber brusquement dans le gaiwan? Ou bien préferiez-vous la sensation d'une main chaude qui vous bascule délicatement?" C'est ainsi que Teaparker répondit un jour à une amatrice de thé intriguée par l'absence d'ustensile pour ce geste! Bien entendu, les mains propres s'imposent! (Le cuisinier aussi manipule les aliments mains nues). 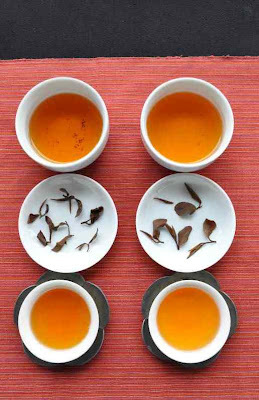 L'infusion est d'une couleur orange dorée éclatante dans la grisaille automnale. 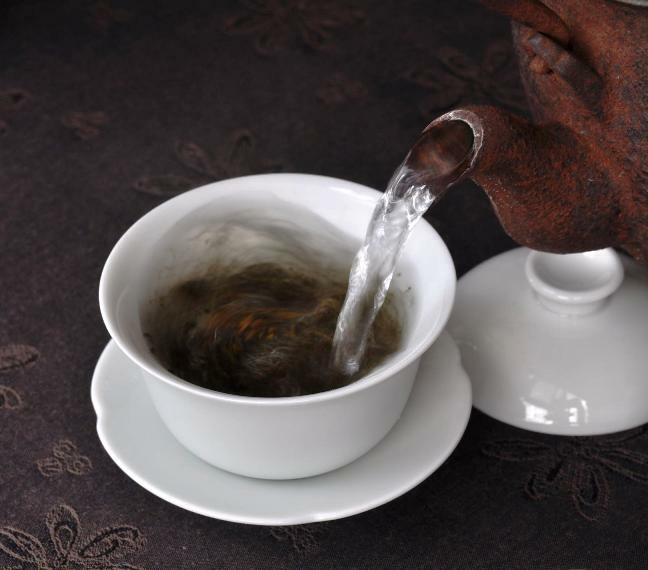 La clarté de l'infusion est excellente. Les feuilles sèches dégagent des fragrances si fines et intenses. On dirait un concerto pour violon. Les notes sont aigües et pures. Un charme pour le nez! 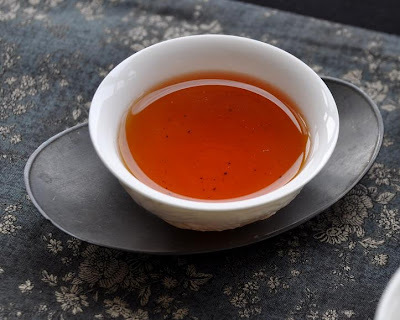 L'enchantement vient de ce que l'on retrouve toute cette finesse et ces notes pures et légères dans l'infusion! Les arômes sont ceux d'un parfum féminin séducteur et naturel. Il a la chaleur douce du thé rouge, mais aussi la fraicheur d'un thé de haute montagne. Le goût s'accorde en pureté et finesse avec les fragrances. Sa présence en bouche est longue et plaisante. 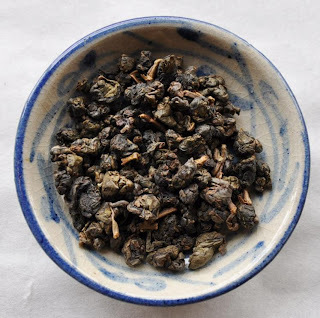 Son Cha Qi, son effet sur le corps est puissant et chaleureux. La porcelaine de Dehua (Fujian) est aussi appelée 'Blanc de Chine'. 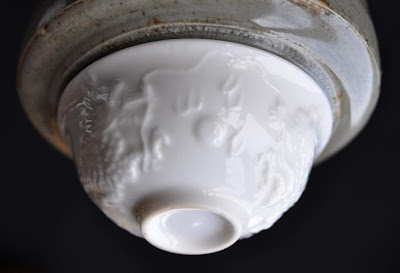 Ce centre de porcelaine précède historiquement celui de Jingdezhen. Plus marquée autrefois, cette porcelaine a encore une teinte 'ivoire'. 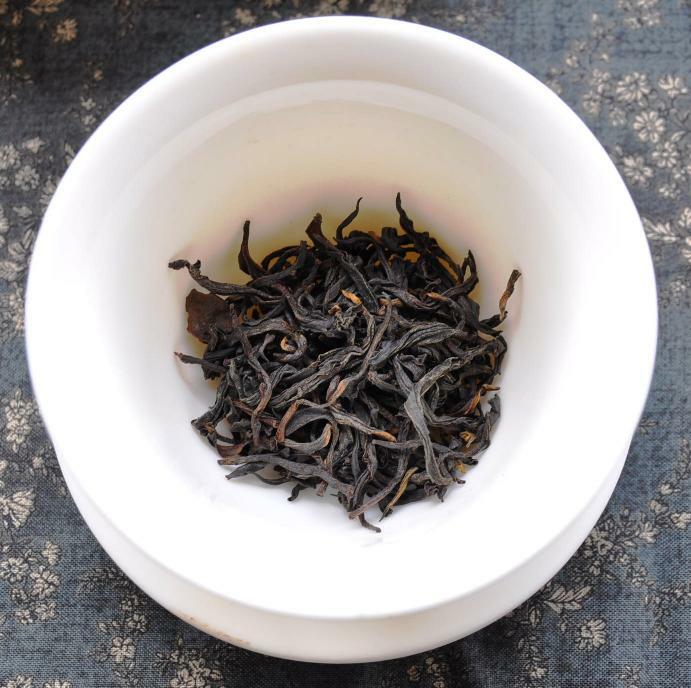 Le rendu des odeurs du thé dans cette coupe est naturel, doux et précis. On notera aussi la jolie transparence de la porcelaine. Elle laisse ressortir le dragon en relief. Les feuilles ouvertes dévoilent leur qualité. La haute élévation de la plantation se traduit par des feuilles et des bourgeons de grande taille, épaisses et souples. Elles ont su donner le meilleur d'elles-mêmes pendant un grand nombre d'infusions. Constance dans l'excellence. 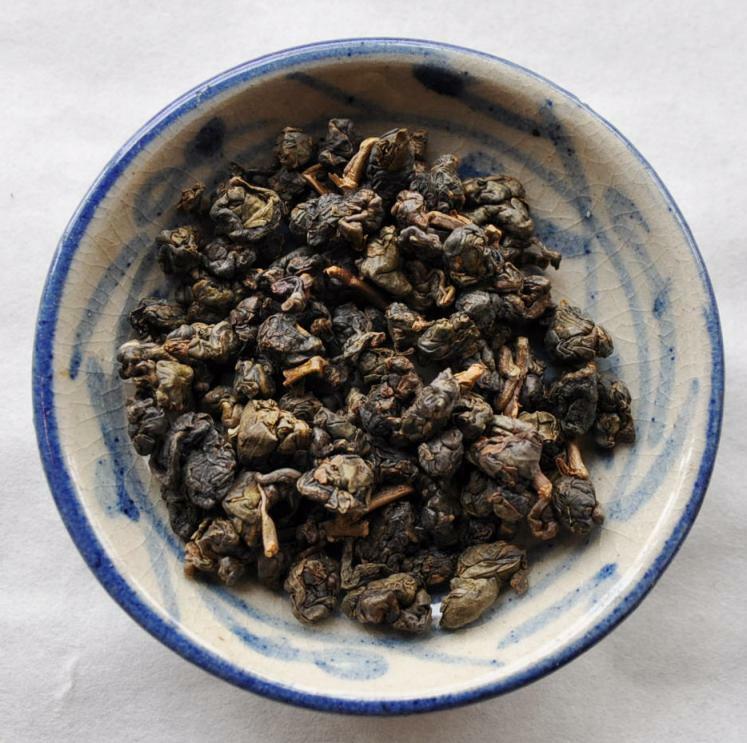 Ce thé rouge me transporte par-delà les nuages, vers la douce clarté lunaire. Thé rouge extrême. Délice fin et sans fin. Cette impression d'infini, de pureté surnaturelle ouvre l'esprit au recueillement. Petit vase réalisé par ma fille! 2 summers ago, I had trouble finding a good Oriental Beauty (in Hsinchu county). So, I expanded my search to the Wenshan area. 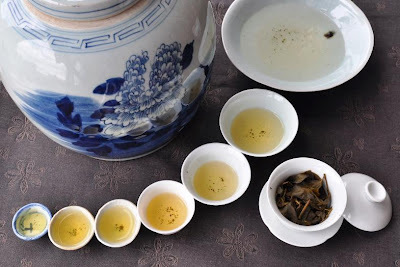 The specialty there is mainly Baozhong tea. However, this region extending from Nangang to Shiding and Pinglin is home to some of the earliest tea farms on Taiwan. In summer, they also produce Oriental Beauty when the high temperatures call for higher oxidation. 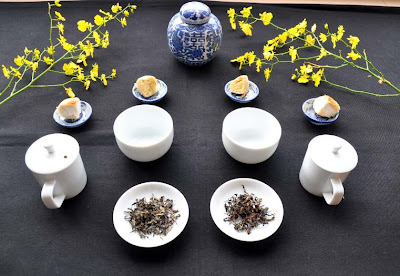 As I spent time searching for a good batch, I was fortunate to meet a farmer who had been collecting various Oriental Beauty samples to educate his son (to take over his tea business one day). 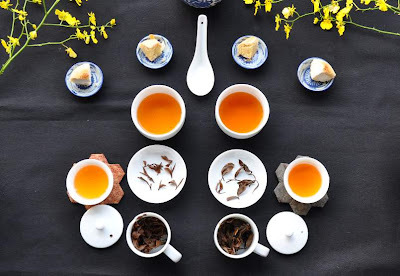 He noticed my interest for this tea and shared this collection with me! Each sample is a Wenshan Oriental Beauty made in the summer of 2010. But each sample is made with a different tea cultivar (and comes from a single batch). Oriental Beauty Oolong has a great potential for aging if it is dried/roasted well. 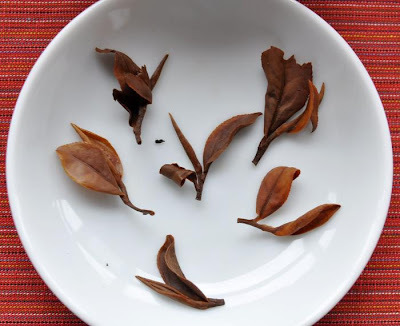 Highly oxidized leaves are less fragile during roasting. 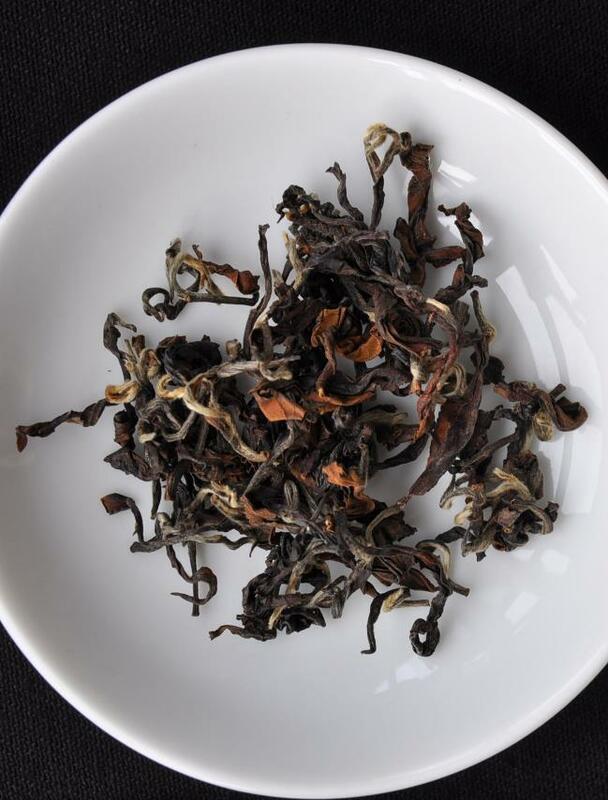 After 2 years in their air sealed foils, I am curious to taste these samples and find out which cultivar makes the best Oriental Beauty! The scents are light, even weak. Dry grass. The leaves seem a little humid. The leaves show many small white tips. The brew is a little cloudy. 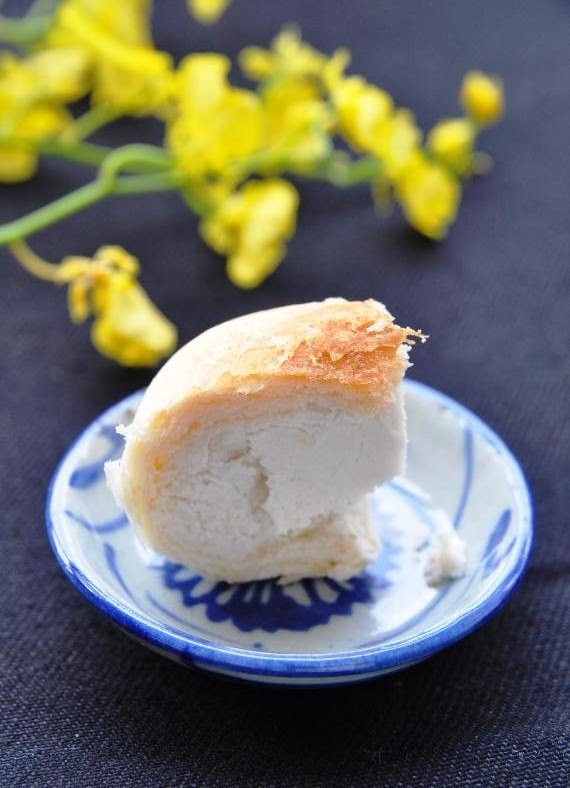 The taste is simple, fruity, but flat overall. No major defect, but no aftertaste. 2. 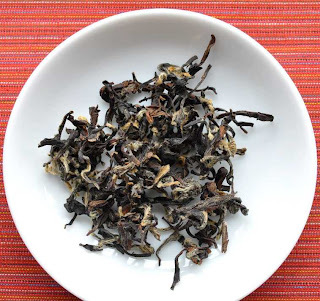 Da Yeh Oolong (big leaf Oolong). Note: you will remember this cultivar used on the East Coast of Taiwan to produce red tea. The dry smell is intoxicating and perfume like. 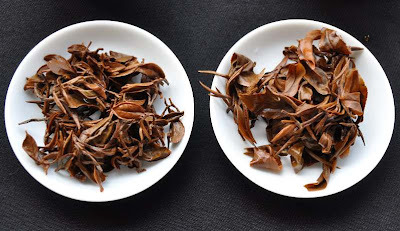 The brew's scents are not as pleasing as the dry leaves, though. The taste has a slight defect. It's like there's something that is hard to swallow. A strange astringency, maybe. But the overall taste has more full body. 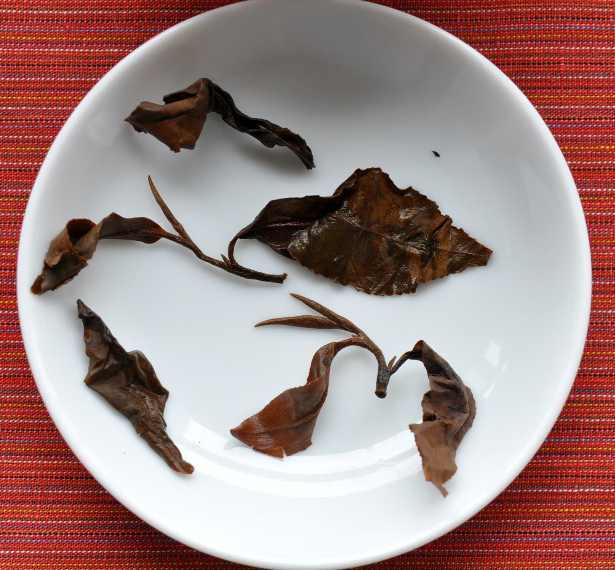 The open leaves of the white cultivar (right) are clearly smaller, more tippy than the Da Yeh Oolong leaves (right). In a duel between these 2 cultivars, the Da Yeh Oolong wins on points thanks to its great scent and better taste. 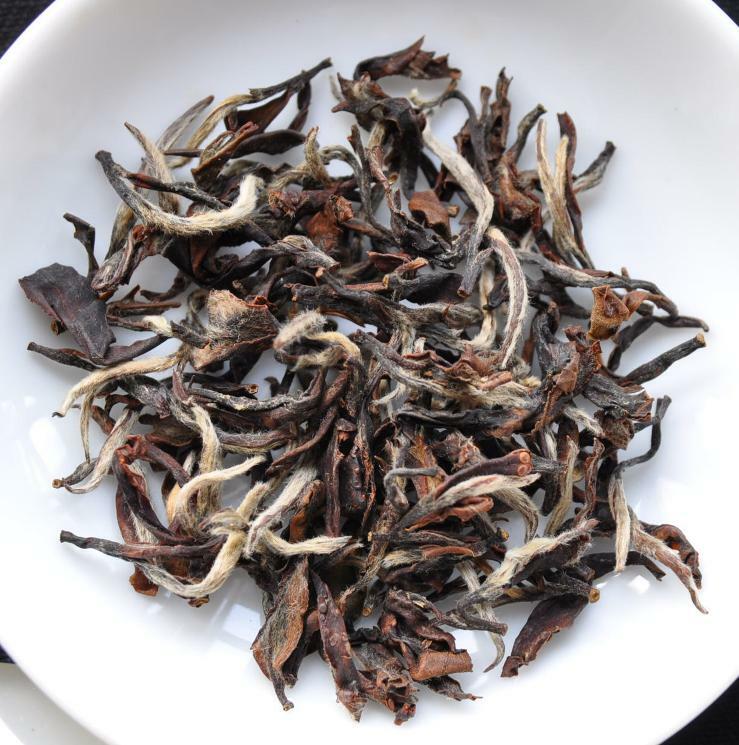 However, the white cultivar dry leaves appear higher grade at first sight, thanks to their small size and generous white fur. 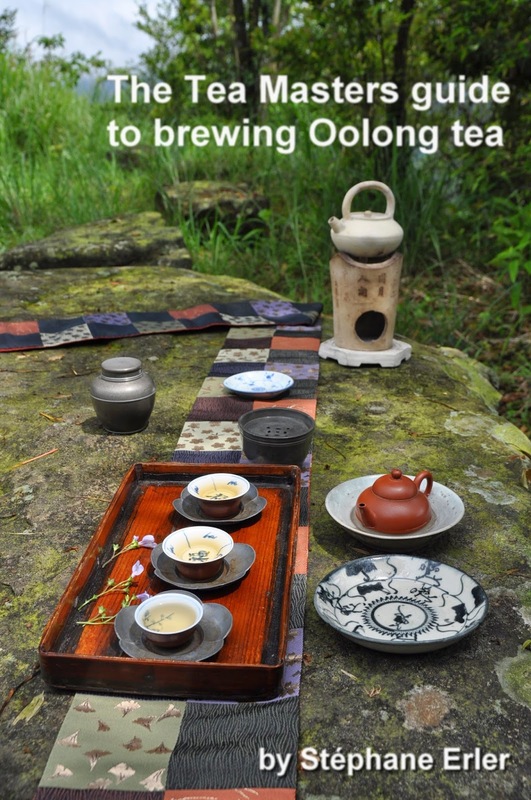 (Another name for Oriental Beauty is Bai Hao oolong, white hair Oolong!) This is why this white cultivar remains popular here: farmers can blend it with other cultivars to improve the overall appearance. Chinese Moon Festival is approaching. That's why you can see some moon cakes as part of the decoration of my Cha Xi. As for the jar, since I am tasting two Oolongs at a time, I chose my Double Happiness qinghua jar! For this contest, I use 2 white porcelain competition sets. 3 grams of tea brewed for 6 minutes. The visual aspect is very pleasant. Different vivid colors appear. The white hairy buds look very 'fat', thick. 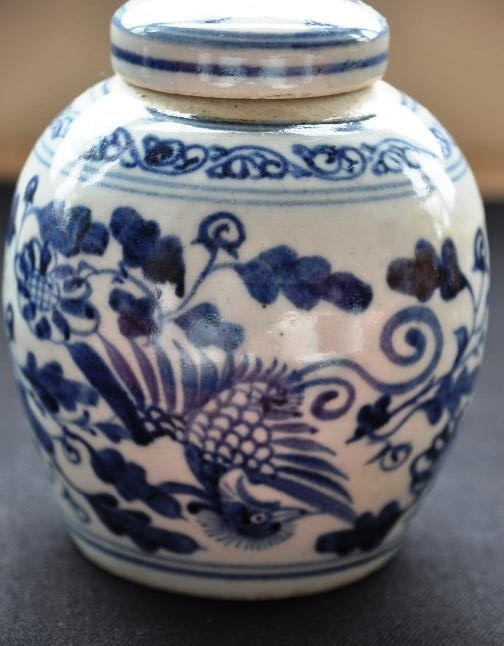 The dry fragrance is very refined and has this almost alcoholic fragrance that aged Oriental Beauties project. The brew has a wonderful transparency and color. It smells like fine lychee juice! The tastes is a little bit on the light side. There were no defects. 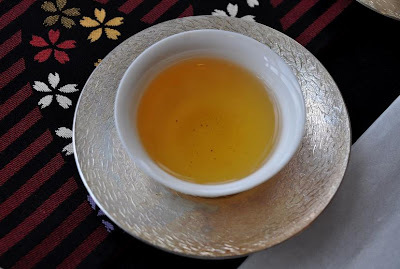 And once I had well tasted the first cup, I drank the rest quickly and happily! 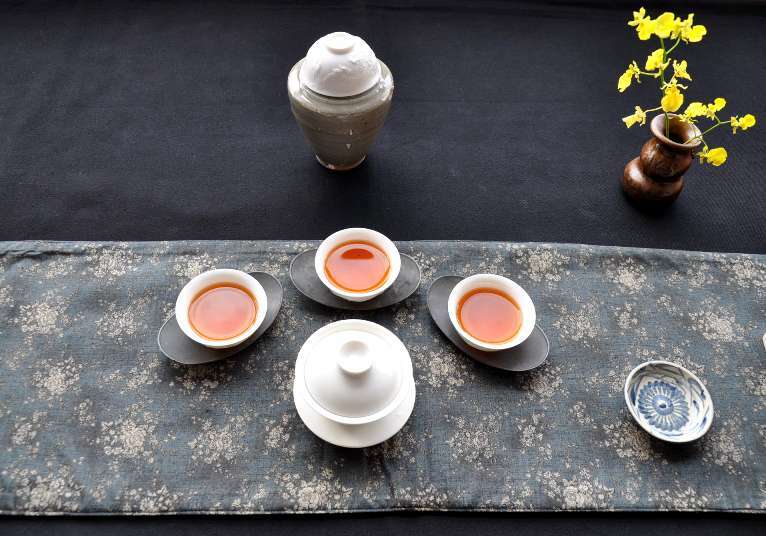 The jinxuan cultivar is also a creation by the Taiwan's Tea Research Institute. Created in 1981, it has the number 12. 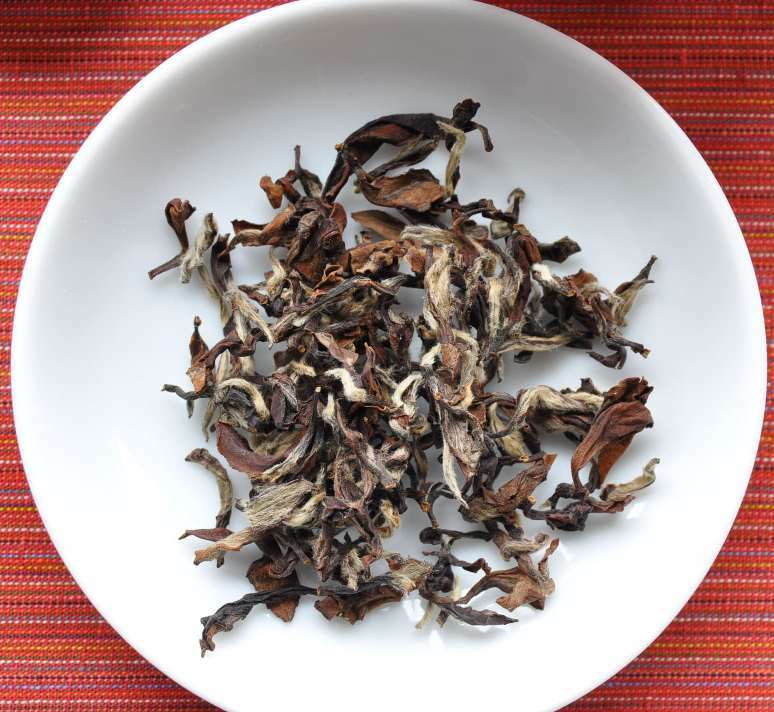 You regularly find a couple Jinxuan cultivars in my selection. 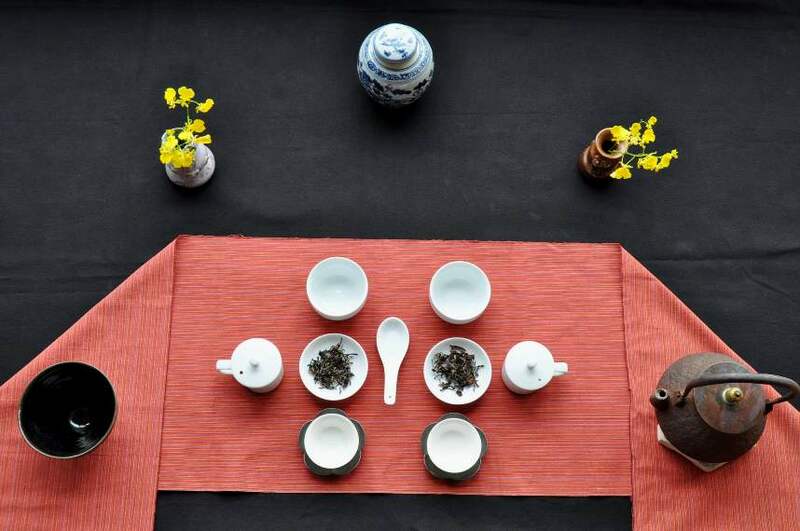 Right now, there is the Jinxuan Oolong from Zhu Shan and a spring 2012 Baozhong. 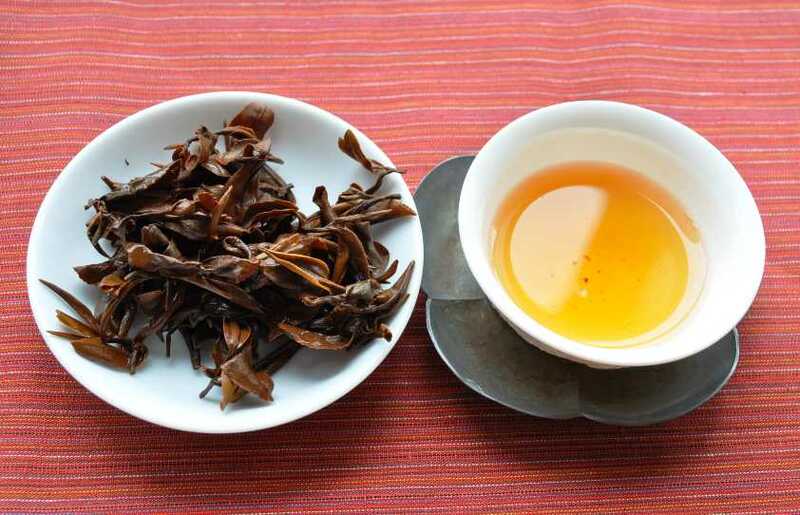 Jinxuan cultivar is generally used to make low oxidized tea. For this high oxidized Oriental Beauty, the dry fragrance also displays the 'alcoholic' scent, but, compared with the Bailu, the scent feels more fuzzy or rough. The dry leaves are long and thin. The brew has a good clarity and is darker than the Bailu's. But the scents are weaker and very common. There is no elegance, purity here. And it leaves an unpleasant bitterness in the mouth. The open leaves of the Bailu are much smaller than the Jinxuan's. This time, the harvesting of buds has paid off in terms of quality of the tea. For the white cultivar, the small buds were not sufficient to be beat the Da Yeh Oolong. 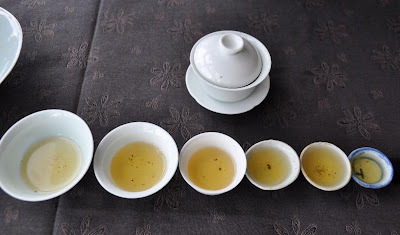 This shows the importance of the cultivar of a tea. That's the reason why you see me mentioning it so systematically. After these contests, we have made great progress on our quest for an elegant and pure Oriental Beauty. Miss Bailu is the current champion. It feels almost like a medieval tournament where knights fought one on one! (Ancient Chinese compared buds to spears!) So, after the fight, now would be the time to feast with delicious food... This traditional moon cake looks like it would pair perfectly with these Beauties. 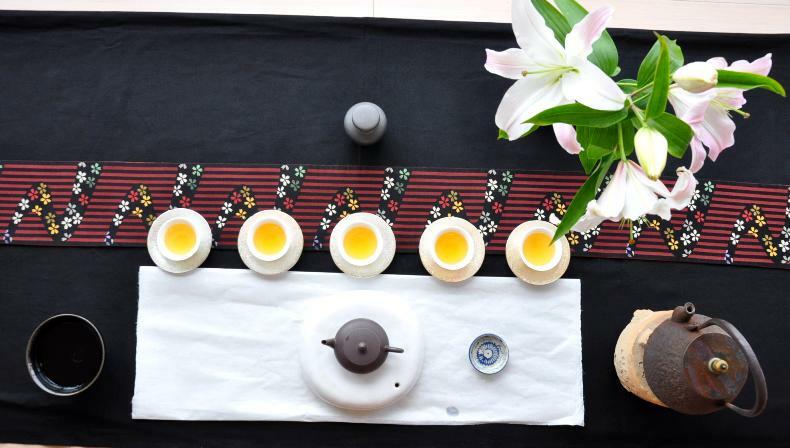 This is also a Double Happiness: tea and moon cake!